We’re continuing our series on implementing sensible solutions to rein in scattered network resources, specifically IP infrastructure management such as DNS, DHCP and IPAM (DDI). In this post, we examine how to simplify day-to-day IP infrastructure operations, in-house or in the field, by rethinking priorities and streamlining the interface between you, your engineers and the network. Each part of the blog series presents real-world scenarios that Men & Mice has helped solve. An infrastructure director of an enterprise company that’s recently experienced a merger. You’re evaluating newly acquired resources, and how to integrate them into the network. For the moment, however, you simply need to keep everything running smoothly while you evaluate how to merge the network resources. You need to quickly see network resource usage statistics, identify overlaps and bottlenecks, and monitor network health. A network administrator delegating day-to-day management across teams and offices distributed over multiple international geographies. To minimize manual changes, cut network overhead and mitigate misconfiguration errors, you have to automate processes and set up local access controls that complement your network security strategy, in tandem with helping your team have the autonomy they need to operate unencumbered. The integrity of enterprise IP infrastructure (DNS, DHCP, IPAM), factors heavily towards the business’s ability to execute on operations and even generate revenue. Yet, there’s very little knowledge, outside of core IT departments, about the functions and responsibilities of the company’s network. Likewise, IT operators don’t always have the full scope of understanding about how network complexities can hinder business efficiencies. What is known, however, is that agility is becoming more important as networks scale or adapt to meet changing demand, with speed and simplicity proving equally valuable to the robustness of the DNS, DHCP and IP address management solution. Instead of lugging the proverbial kitchen sink everywhere you go, or retro-fitting your network needs into a uniform solution (especially when doing so creates greater hurdles), that, well, doesn’t actually serve your needs, choose a lightweight overlay solution that lets you resolve common issues and manage network functions quickly, every day and provides the visibility necessary to maintain the network’s integrity. This will enable you to simplify workflow and minimize the complexities between you and the network, no matter which area of the network you are focused on any given day and no matter the underlying architecture behind it. Complete visibility helps you make informed decisions. Coupled with the flexibility to quickly maneuver, the solution you choose must enable you to adapt to changing needs without disruptions in network functionality. With the robust and complete feature set of the Men & Mice Suite and the built-in visibility it offers, you can tackle large projects and deep (re)organization all while getting a much clearer view of IP infrastructure management holistically. The newest version of the Men & Mice Suite, introduced a few months back, delivers the management power and day-to-day operational functionality through our light-weight overlay software, neatly packaged with an improved web application. The web application is designed specifically for day-to-day operations where speed and agility is paramount. For example, you can quickly organize and manage DNS zones and records or IP address ranges, DHCP scopes and IP addresses. Its features are streamlined, to manage the most common tasks performed through the Men & Mice Suite with additional Quick filters and Quick command to further cut down time. If you need to deep dive into the guts of your network operations, fear not, you have the Windows management console as well. Engineers overseeing various areas of your network can quickly respond to and solve IP allocation issues, move DNS zones and DHCP scopes, remove bottlenecks locally and experiment with moving more workloads to the cloud, without sacrificing the ever important visibility. Automating and delegating tasks that are defined through fine-grained access controls within the Men & Mice Suite helps alleviate IT overhead and affords some localized autonomy in everyday scenarios, making day to day network management more efficient. Infrastructure directors overseeing fragmented networks can get greater visibility and operational functionality. Men & Mice Suite distills powerful DDI capabilities into a non-disruptive software package, complete with an agile tool for day-to-day management, offering compatibility with Unix/Linux, Windows, and Cisco IOS as well as functionality across Azure DNS, Amazon Route 53, Dyn, NS1, Akamai Fast DNS, and IPAM in AWS, Azure and OpenStack. Manage, sync and automate network changes and authorizations, filter and record changes through unified audit trails and get comprehensive insight into large-scale networks through one unified dashboard. In the last part of our playbook series, we’ll take a closer look at how to reinforce IP infrastructure security and prepare for DDoS mitigation and defense against other threats. Continuing our series on creating a sensible strategy to consolidate management of your scattered network resources, we take a look at what happens when new resources need to be added to your network. Each part presents real-world problems that Men & Mice have experience in solving. an MSP Infrastructure Server Admin, using Microsoft. Your business utilizes Virtual Machines to handle client workloads, but without an efficient handling of IP addresses, your DNS doesn't get updated fast enough. Customers complain about lags. a Product Manager for a SaaS company seeing an uptick in customer numbers. You have the system set up just right, but to handle all the demand, you are looking at pulling in dynamic resources using multi-cloud accounts. You also don’t want to add more team members to handle it, but automate instead. a Director of Operations overseeing a large network spanning several locations. At the start, you used to have spreadsheets to track IP addresses, and kept configuration files practically in your head. Surely there must be a better way. It makes no sense to start from scratch unless you have no other option. Any business that's been around for a while will have their workflows and configurations set up for the most part. And with the array of affordable cloud resources in services like AWS and Azure, moving on-prem configurations to cloud infrastructure becomes a viable option. From smaller networks to large, from on-prem to cloud, from manual spreadsheets to automation: it’s just a matter of scaling. A DNS, DHCP, and IPAM solution to pull data unobtrusively from your existing configurations. You may have been using spreadsheets for tracking IP addresses, and a local library with DNS configuration files. Whatever they may be, you need to plug them into the new solution. In addition, it needs to replicate and automate provisioning for new resources. Bonus points for a holistic approach, where various vendors can be brought in without the accompanying overhead, special training or new personnel. In short, you want to use an API-driven solution to control and manage all others. A software-based, API-driven, and back-end agnostic solution, the Men & Mice Suite was developed to simplify core management of IP infrastructure in heterogeneous environments. The Men & Mice Suite is a single-pane-of-glass overlay for your entire IP infrastructure, current, and future. Adding new resources, regardless of platform or vendor, isn’t hindered with compatibility problems since the software takes care of communicating with various on-prem solutions and cloud services through powerful, reliable APIs. Overseeing multiple locations and resource allocations for different teams or projects can be done elegantly and easily. Already tested configurations can be deployed swiftly in new environments, extending oversight and reducing time for onboarding. Once in place, configurations can be scaled and replicated easily and automatically. Copy or extend DNS zones and DHCP scopes, and deploy user authentication (including MS Active Directory) for new locations. Spawning new virtual machines on cloud infrastructures is supplemented by IP address assignments that are reflected in all DNS servers. Once those IPs are released, the changes are automatically propagated through the network at once. You and your team can reduce project time and cost significantly through more quickly responding to the changing needs of your business, without the need to set up lengthy processes each time. Multi-cloud environments can be plugged into the Men & Mice Suite. Automated through a single API layer, and secured with role-based access control the network can scale out to any size and into any platform to accommodate workload, and scaled back once resources become unnecessary. Plus, with Men & Mice, you can manage and migrate workloads to, from and between your on-prem and whichever best-in-class cloud service make sense for you. We'll cover hybrid and cloud-native solutions specifically in our next post. Each part of this blog series presents real-world problems that Men & Mice have experience in solving. This week’s focus is on Conflict Resolution. CIO with several geolocations but lacking a core network management solution, whose company just got acquired. You're looking for a solution that would be a good fit for the merged environments. CTO of a solutions provider for companies. One of your customers, operating two data centers and building another for cloud services, needs an IPAM solution that can bridge between on premises and cloud. Consultant, advising with a project involving the merger of two environments. You're looking for a single automation platform that can resolve the issues arising from overlapping network spaces. The number one obstacle is resolving conflicts between services, applications, network environments and geolocations, at the IP address, DHCP and DNS levels.Conflict resolution increases security, efficiency and availability. At the first step you need an easy way to analyze data from across network components. Longer term, one that helps ensure that new IP address assignments, DNS zones, and DHCP scopes are not created without cross-checking for conflicts throughout the entire network environment, including your on-prem and cloud (and multi-cloud as is often the case now). A software-based and API-driven solution, the Men & Mice Suite was developed to simplify core management of IP infrastructure in heterogeneous environments. Software-based means nominal performance impact on your hardware and cloud resources, and easier deployment because there are no physical appliances to implement. The Men & Mice Suite works on top of any environment(s) you have without impeding performance or disrupting operations. API-driven design creates convenient ways to manage and automate your DHCP, DNS, and IP Address Management. It also collates various platforms into a single control mechanism through a central interface. The Men & Mice Suite boasts a backend-agnostic API that plugs into network components seamlessly. You and your team can reduce project time and cost significantly through more quickly identifying overlaps and conflicts, which are visible in the Men & Mice Suite, as well as more quickly identifying means for resolving them. Resources, be they related to DNS, DHCP, or IP Address management, can be replaced, upgraded, or expanded without the need to start over from scratch. Plus, with Men & Mice, you can capitalize on and migrate to/from whichever best-in-class cloud services make sense for you (Azure, AWS…). Our commitment to efficient network management has a new number! The Men & Mice Suite 9.1 is a feature release with a host of cloud-ready enhancements plus the usual suspects (bug fixes and improvements). Transparency, responsiveness, and ease-of-use are all core principles of Men & Mice for keeping networks healthy and safe from DDoS attacks and other DNS network failures. The new web-based management application serves as an alternative to the Men & Mice Suite Windows-based management console. It’s designed to make performing day-to-day tasks, management functions and generating reports related to DNS and DHCP operations easier. The application features three sections: DNS, Networks and Reporting. The DNS section makes all your DNS zones accessible from a single place. The Networks section gives you instant access and overview of your networks. Reporting lets you quickly find and run existing reports. Its Quick Command functionality cuts down time on common tasks such as finding and working with DNS zones or records, IP address ranges, DHCP scopes and IP addresses. xDNS Redundancy, which can be used to synchronize DNS zones hosted with multiple cloud providers, now includes support for Active Directory-hosted zones. Zones in a redundancy group can be assigned to read-only mode, so that changes made to a DNS zone outside of the Men & Mice Suite will not be replicated to all other zone instances. Version 9.1 streamlines the migration and management of a large number of DNS zones with Azure DNS and Amazon Route 53 by utilizing cloud-native features to monitor changes to DNS made outside of the Men & Mice Suite, greatly improving synchronization of DNS data from the cloud providers. DNS software on Men & Mice virtual appliances has been upgraded to BIND 9.11, which supports various new features as well as DNSTAP. Details on DNS queries received and DNS replies sent by the Men & Mice virtual appliances can now be logged for further processing by enabling and utilizing the powerful DNSTAP feature with minimal performance impact on the appliances. The virtual appliances can also now function as NTP (Network Time Protocol) servers and be served by the same network infrastructure as DNS and DHCP. Currently this functionality is manual and can be implemented per request with our support team. “The Men & Mice Suite v9.1 represents our commitment to enabling customers to adapt their infrastructure to be more software-enabled, cloud-ready and redundant, with increased visibility, control, security and automation.” --Magnús Björnsson, CEO of Men & Mice. Complex enterprise network infrastructure can — and should — have the same elegant simplicity and responsiveness as IT professionals expect from customer-grade solutions. In the new release, Men & Mice has combined its nearly 30 years of expertise in developing DNS, DHCP and IPAM solutions with modern UX best practices to deliver a compelling, enjoyable management interface on top of a best-in-class, robust software-based DDI product. If you want to try Men & Mice Suite v9.1 for free just click the button below. Not ready? Read more about the Men & Mice Suite, or get an online demo. Topics: IPAM, DNS, DHCP, Redundant DNS, DDoS, IP address management, hybrid cloud, hybrid network, "cloud dns"
The beauty of DHCP is the speed at which it functions. Basically, DHCP (Dynamic Host Configuration Protocol) does what administrators can do manually, but DHCP just does it automatically, more efficiently, and in a fraction of the time. Yet the bigger a network gets, the more DHCP servers and scopes are needed to dynamically assign, or lease, IP addresses and related IP information to network clients. The number of servers and scopes and the way the load is distributed and processed affect the speed at which networks can keep DHCP data fresh and IP leases available for use. On large networks, how efficiently DHCP lease data is documented, processed and synchronized becomes just as important as the initial matchmaking between DHCP clients and servers. DHCP does the hard work of handling communication between servers on a network, and client computers trying to access that network. If the series of messages between a DHCP server and a client computer would be illustrated as a conversation, it would probably look something like this. Mind you, at any given moment on a large network, hundreds, or even thousands, such conversations can be occurring simultaneously. 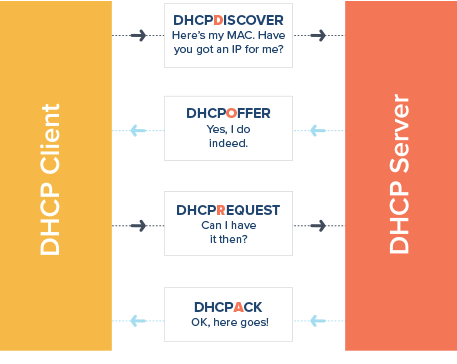 On top of that, the client computer sends its DHCPDISCOVER broadcast packet to all available servers, and all available servers can respond with a DHCPOFFER. The client is not programmed to be picky and always accepts the first offer it receives. Once they detect that their offers were not accepted, the other DHCP servers will withdraw their offers. In short, there’s a whole lot of to-and-fro action behind the scenes that is invisible to network administrators and users, but still finds its way into DHCP servers’ lease history. To complicate matters – or simplify it – these DHCP client-server relationships, or leases, are mostly temporary arrangements. Both parties know it will end. The server will revoke the lease once it’s expired. The client, on the other hand, can attempt to keep the lease by renewing it, or start looking for another IP address lease if the one they had had expired. Apart from doing matchmaking between clients and servers, DHCP also ensures that each network client has a unique IP address and appropriate subnet masks. If two clients were to try and use the same IP address, neither of them would be able to communicate on the network. These rotating relationships make the way DHCP lease data is documented, processed and synchronized so much more critical. If this is not done fast and efficiently, the whole process of dynamically assigning IP addresses can become slowed down, leaving DHCP clients, servers and ultimately network users, frustrated and ineffective. Once networks run to hundreds, or thousands of DHCP scopes and servers, one needs to re-assess the way DHCP data is processed, and develop ways to improve speed and efficiency. This is exactly what Men & Mice developers set out to achieve in Version 8.3 of the Men & Mice Suite. Optimizing processes in these areas has resulted in lightening the often heavy load on DHCP servers, making DHCP server management considerably faster and more efficient – and more pleasurable for the people in charge of keeping it all going, all the time. To dig into the more technical aspects of these enhancements and get the lowdown on what this boost in DHCP performance and scalability could mean for you or your network, get in touch with one of our sales engineers to walk you through the details. Funny (or not) as that may be, how to make the most of legacy infrastructure in the age of accelerating technological disruption and rapid cloud services adoption, is the harsh reality most enterprises face today. Well-known for its fast, reliable and efficient performance on large enterprise networks, the Men & Mice Suite already has a reputation as the go-to, enterprise-class, software overlay DNS, DHCP and IP Address Management (DDI) solution. With the release of Version 8.2 of the Suite, Men & Mice further solidifies our position as the commercial DDI solution best equipped to help large enterprises capitalize on legacy infrastructure, while adopting cloud services to advance business agility and scalability. Almost three decades of expert innovation in DNS, DHCP and IP Address Management has given Men & Mice unique insight and expertise into creating solutions that confidently mitigate the shocks of technological disruption. Built as an enterprise-grade, back-end agnostic solution and deployed on top of DNS and DHCP infrastructure, the Men & Mice DDI Suite pulls together critical network data from wherever it is kept, on-premises, in the cloud, hybrid cloud or multi-cloud, and turns a potential hot mess into a comprehensive overview, accessed and controlled from a single pane of glass. The Men & Mice Suite provides consistent administrative controls on heterogeneous networks, with unparalleled support for Windows DNS and DHCP, BIND, Unbound, PowerDNS, ISC DHCP, Kea DHCP, Cisco IOS, OpenStack and Azure DNS and Amazon Route 53. Designed to integrate seamlessly with the VMware Orchestrator framework, the Men & Mice Suite VMware vRealize Orchestrator plug-in allows for fast and efficient provisioning of virtual machines. The first DDI solution to fully integrate with Microsoft Active Directory (AD), the Men & Mice Suite incorporates management of users and groups through AD, while granting access rights and building up roles and responsibilities through the Men & Mice Suite, ensuring advanced and secure granular role-based access management. Offering you the flexibility to control your network as it suits you best, the Men & Mice Suite provides three powerful interfaces: the Men & Mice management console, the Men & Mice web interface, and, the strong and consistent Men & Mice API, communicating in SOAP, JSON-RPC and REST. The Men & Mice API, especially popular with our customers, provides the robust abstraction tools necessary to build and extend automation. From Version 8.2, the Men & Mice Suite’s back-end agnostic capabilities are extended to include advanced, multi-cloud IP Address Management and integrated support for external DNS service providers. Building on the flexibility of its architecture, Men & Mice Suite Version 8.2 consolidates on-premises and cloud networks in one view and point of access through support for IPAM in Azure and AWS, and by adding support for DNS service providers NS1 and Dyn to existing Men & Mice support for Azure DNS and Amazon Route 53. Unique on the DDI market, and new in Version 8.2, the Men & Mice xDNS redundancy feature enables multi-platform DNS redundancy for ultimate network high availability, and successful mitigation of the fallout from DDoS attacks and other DNS failures. xDNS redundancy provides the abstraction level necessary to replicate and synchronize critical DNS zones across multiple DNS service provider platforms, eliminating the possibility of a single point of failure resulting from dependency on one external DNS service provider. As IT matures into a key element for easily scalable business development and product delivery, and ultimately a driver of business growth, the need for high network availability, reliability and performance escalates. Follow these links for more information on Men & Mice xDNS redundancy feature, or multi-cloud IP Address Management. To see Men & Mice xDNS redundancy in action, check out the xDNS Redundancy webinar, jointly presented by Men & Mice and NS1. Curious about how the Men & Mice Suite can benefit your network? Get in touch with one of our Men & Mice Sales Engineers, or get your free Version 8.2 license for a complimentary 30-day trial experience. At the end of a year overshadowed by Mirai botnets, leaked emails, late-night Twitter rants and talk of upgrading the dormant Cold War to Version 2.0, perhaps this Christmas is the ideal time to sit back, pop that (nut) roast in the oven and relax with a little something different. Have your pick from this short collection of fun IPAM-like things to enjoy this festive season. First up, a highly entertaining TED talk by Mikko Hypponen, well-known security specialist from F-Secure. Hilarious anecdotes, most notably when tracing the makers of the first PC virus (Brain A), help to make Mikko’s talk on all things cybercrime just as relevant today as it was when he first delivered it in 2011. If Mikko’s talk set in motion a nostalgic longing for the good old days of ‘hobby’ viruses, what better place to visit than the Malware Museum? Take a walk on this ‘formerly’ wild side and rediscover the almost cutesy retroviruses of yore. OK, not quite so yore, only the 80s and 90s, but still tech yore, really. It’s hard to believe Casino and Walker may have paved the way for the massive effects of a Mirai botnet or bizarre developments such as ransomware as a service, but hey, everything’s got to start somewhere, doesn’t it? Speaking of Mirai. Not satisfied with taking the DNS out of Dyn in October in the biggest DDoS attack witnessed so far, a new Mirai strain set its sights on routers and modems in November, causing an outage affecting 900,000 Deutsche Telekom users and possibly leaving up to 5 million devices vulnerable With commercial routers biting the malware dust in such spectacular fashion, perhaps it’s just better to build your own. This handy Ars Technica guide to building a Linux router makes it look easy. Well, at least for some of us. Let’s face it. All things DDI aren’t very funny. Actually, very little is. But that doesn’t stop some of us from trying to make it funny. And the rest of us from trying to explain the trying to everyone who doesn’t get it. If you are really at a loss for fun things to do this Christmas, then maybe this SysAdmin thread will liven it up for you. Or maybe not. Worth a shot for some of the comments on the comments, though! Last but not least. Some useful DDI tips and tricks as described by the 13 Icelandic Yule Lads. Monitoring DNSSEC, doing IPAM subnet discovery or sniffing out rogue IP addresses take on a whole new meaning if you do it with the help of the ogress Gryla’s boys. What can possibly go wrong if Doorway Sniffer, Pot Scraper and Sausage Swiper try to find ways to do DDI better? This seasonal eBook compilation makes for easy bed-time reading. Be warned: not for the faint of heart! 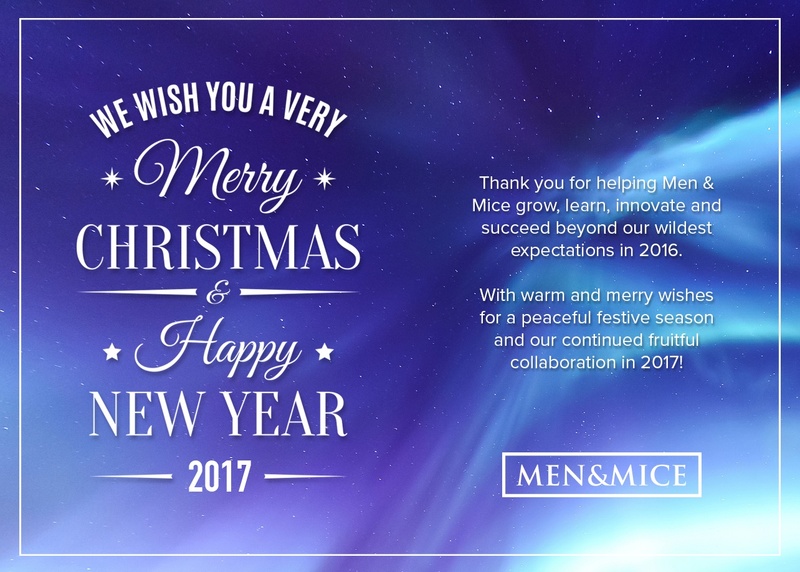 Merry Christmas from the very merry bunch at Men & Mice! Men & Mice celebrates the arrival of the long, arctic summer nights with the release of Version 7.2 of the Men & Mice Suite. This blog post offers a quick round-up of what’s new in Version 7.2. Versatile simplicity, as always, forms our bottom line. Version 7.2 is no exception. This time around, support for the new ISC Kea DHCP server and a dedicated UI for Windows 2016 Response Rate Limiting (RRL) should warm the hearts of network administrators far and wide. At least, that’s what it’s been doing for us here in the North! Let’s run through what major highlights Version 7.2 contains. Men & Mice introduces support for the brand new ISC Kea DHCP server, the natural successor to the ISC DHCP server. Like its namesake, the uniquely strong and intelligent New Zealand kea parrot, the brand new ISC Kea DHCP server is a powerful beast that reaches more than 1000 leases/second, allowing for clean and fast implementation of both DHCPv4 and DHCPv6. Kea DHCP also boasts PXE Boot Support, DHCPv6 prefix delegation, dynamic reconfiguration and dynamic DNS updates. As with other servers supported by the Men & Mice Suite, the Kea DHCP server functionality is fully controlled through the Men & Mice Management Console. This includes the effortless migration of IP subnets (scopes), including options, from ISC DHCP to Kea DHCP. In the spirit of open source, Kea DHCP is released under the widely used Mozilla Public License 2.0, paving the way for collaborative improvements to the source code for many years to come. A taste of the Kea DHCP and how it integrates with the Men & Mice Suite, can be enjoyed in this recent webinar presented by Mr Carsten Strotmann. For those interested in plunging into the Kea DHCP full force, Men & Mice, in cooperation with ISC, is offering intensive two-day hands-on training courses in Europe and the USA in the fall of 2016. The courses are aimed at small groups, so don’t forget to sign up in time! The Men & Mice Suite’s architecture as an overlay solution exhibits a singular synergy with Windows Servers, making it the logical solution for any Microsoft-based network. Consequently, the Men & Mice Team is developing and releasing support for specific new Windows 2016 features as and when they are made available by Microsoft. From Version 7.2, the Men & Mice Suite supports all of the primary Windows DNS and DHCP Server 2016 features. Support for other new Microsoft Server 2016 features, such as DNS Zone Scopes and DNS policies, is scheduled for the Men & Mice Suite Version 7.3 release later this year. Security only works if you work it, and the more tools you have to work your security, the better. Adding to your menu of security options, the Men & Mice Suite Version 7.2 introduces a dedicated UI for the Windows 2016 Response Rate Limiting (RRL) feature. Response Rate Limiting can make all the difference in the event of a Denial of Service (DoS) attack on DNS servers. During a DoS attack, the IP number of a victim computer is used to send high volumes of forged DNS queries to multiple DNS servers. DNS servers tricked into sending replies to these queries can push the number of DNS requests and replies over a manageable threshold and disable targeted networks. Restricting DNS servers’ response rate with Response Rate Limiting helps to control a suspicious volume of malicious enquiries and minimize the impact on the affected servers. 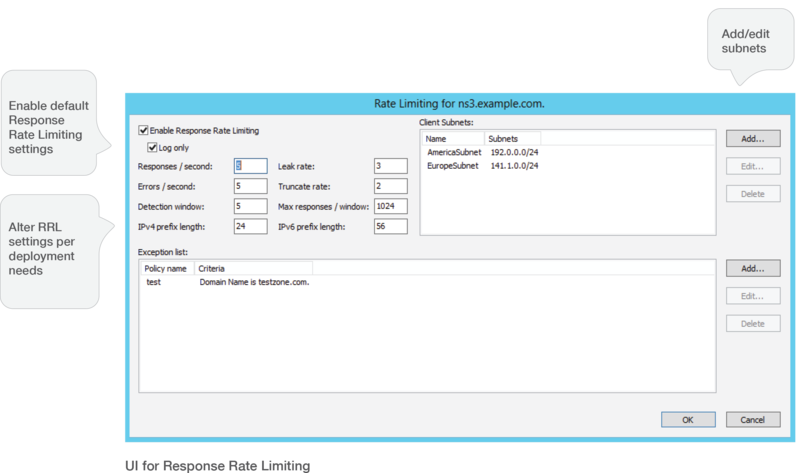 Microsoft sheds more light on Response Rate Limiting and how it works on their TechNet blog. Spring cleaning at the Men & Mice headquarters has resulted in a Management Console with a cleaner, and ultimately more manageable, look. From Version 7.2, windows in the Management Console are dockable, making it both simpler to manage and easier to navigate for the user. The Men & Mice Suite Release Notes provide more detail on other minor improvements and fixes that form part of the Version 7.2 Release. That wraps it up for a quick round-up of what Men & Mice Suite Version 7.2 has to offer. In the next months, Men & Mice will publish further blogs and webinars on installing and managing Kea DHCP, Windows 2016, Docker containers and Yeti. Watch this space! Or better yet, just watch Men & Mice. 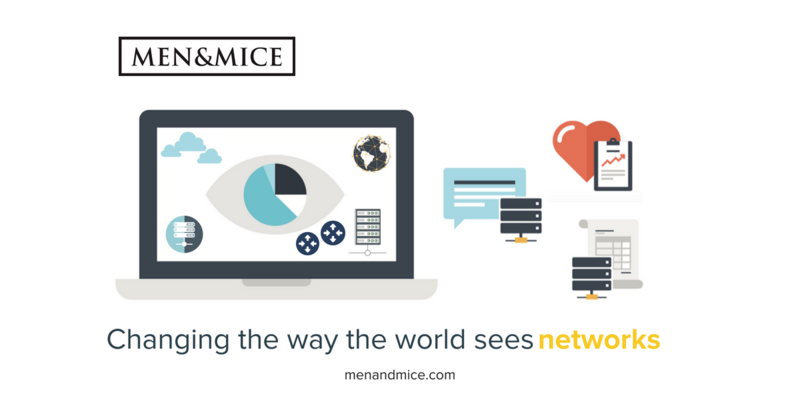 Men & Mice, one of the world’s leading providers of DNS, DHCP and IP address management (DDI) software solutions, announces the release of Version 7.1 of the Men & Mice Suite. The Men & Mice Suite is a software-based IP Address Management (IPAM) solution, used by many large and growing global enterprises, to establish secure and efficient control of their networks. As an overlay solution with a particularly robust SOAP API, the Suite is deployed on top of existing DNS and DHCP servers, thereby granting seamless control over hybrid environments that include Linux, Unix, Microsoft and Cisco IOS servers - all without the need to replace your current IP infrastructure, and providing tight MS/AD integration where required. Supporting a wide range of DNS and DHCP servers (BIND, Microsoft DNS/DHCP, Unbound, Cisco DHCP and ISC DHCP) and increasingly reaching further into the cloud with support for Amazon Route 53 and, from Version 7.1, also Microsoft Azure DNS, the Men & Mice Suite offers superb solutions for network administrators involved in the daily battles of administration, planning, auditing and reporting in large networks. Version 7.1 introduces the Men & Mice long term support (LTS) release strategy, concurrent with the new Men & Mice Suite version naming scheme. Both the LTS release strategy and the new Suite version naming scheme aim at better aligning Men & Mice products with the diverse protocols and demands existing in our customers’ individual operating environments. For more information on the Men & Mice release strategy and naming scheme, please read the white paper here. Together, Amazon and Microsoft are the undisputed leaders in cloud services with their respective cloud computing platforms, Amazon Web Services (AWS) and Azure. In 2014, Men & Mice took the initiative with transforming DDI for the cloud by adding support for AWS Amazon Route 53. 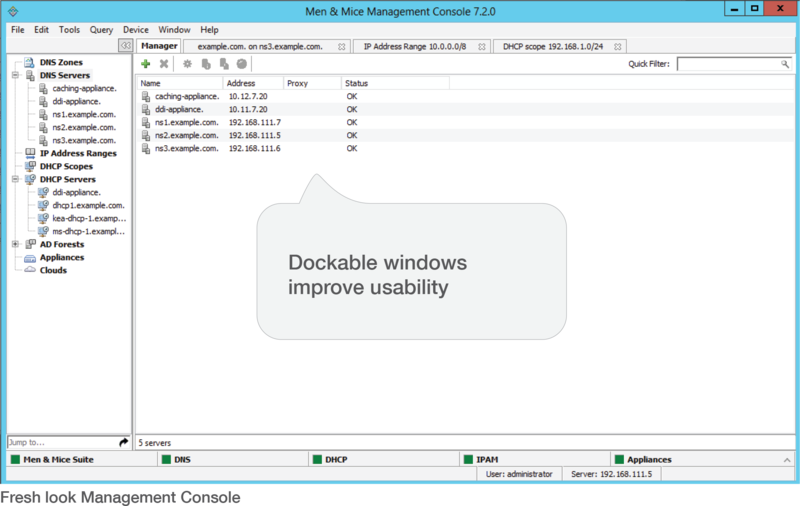 Now, from Version 7.1, Men & Mice is taking DDI cloud dexterity one step further by also adding support for Microsoft Azure DNS. 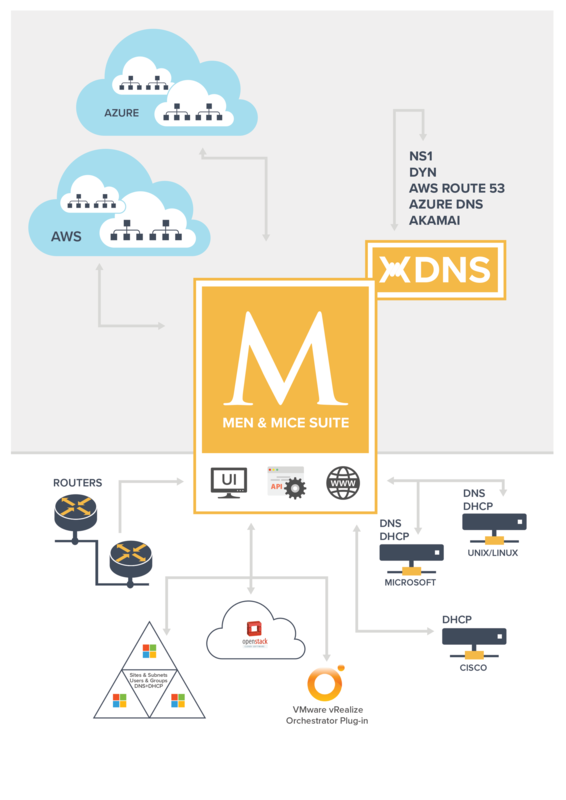 Known for its versatility in heterogeneous operating environments, support for Azure DNS further strengthens the Men & Mice Suite’s ability to scale successfully with businesses as they grow outwards, and upwards, into the cloud. Microsoft SQL Server 2014 is now supported as a database backend for Men & Mice Central. Improved usability with the First Use Wizard. Users will now be able to paste in all license keys at once instead of having to paste them in one at a time. The Linux installers for the Men & Mice Remote Controllers have been improved and features added, such as a silent mode which enables the user to automate the installation of the Men & Mice Remote controllers. A new Scope Creation Wizard makes creating DHCP scopes even easier. No need for untimely upgrading prompts. From Version 7.1, the Update Manager has been adapted to accommodate long term support (LTS) releases. Users can now select if they only want to be notified of LTS releases in the Update Manager. DHCP lease history gathering has been improved, lightening the load on SQL servers. Men & Mice Suite administrators can now disable one or multiple servers from within the Men & Mice Suite. Detailed release notes on Version 7.1 can be obtained here. Founded in 1990, Men & Mice is headquartered in Iceland. Drawing inspiration from our strategic geographic location midway between the USA and Europe, we possess a unique perspective on the challenges of DNS, DHCP and IP address management faced by medium to large, and growing, global enterprises today. The combination of our extensive experience and expertise and our excellent software products, provides our customers with versatile, yet highly reliable, DDI solutions. In a competitive DDI market, we pride ourselves on our ability to adapt our solutions to suit our customers’ needs. We don’t expect our customers to adapt their needs to suit our solutions. Men & Mice has operations in the US, Europe and Asia, as well as resellers in many countries. Contact us at Sales or Call us at +1 408.516.9582 to speak to a sales representative.